The Moravek range of BC Inline Automatic Beer Carbonators offer the brewer a number of key benefits for his packaging operations in terms of production, but most important of all the consistent high final product quality of packaged beer it produces. 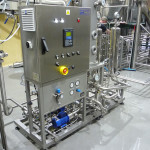 The Moravek BC Beer Carbonator is specifically designed to automatically inline carbonate beer and can also be used to carbonate other products such cider, hard cider, sparkling wines, soft drinks and mineral water in the CO2 content range of 2 to 8g/litre ( 1 to 4 volumes) CO2 content. In conjunction with keg filling the BC system can also be used to nitrogenate stouts, porters and nitro keg style ales. The Moravek BC Beer Carbonator range is well proven technology for the company having been in production for over ten years, with a highly satisfied brewery customer base around the world. Smaller CO2 bubbles that result from efficient gas atomise carbonation gives beer, cider or wines a smooth natural carbonated finish. Bottled beer from the same brew batch – glass on the right with Moravek’s BC gas atomise beer carbonation – glass on the left without. Ozzbeco Brewery Nairobi Kenya, Beer type: Viennese Lager. Set temperature and carbonating pressure ensure consistent carbonation levels are maintained at all times and product cannot be over carbonated. By Boyles laws of physics; a set temperature and pressure achieves a set product saturation point which makes over carbonation impossible with the BC system. 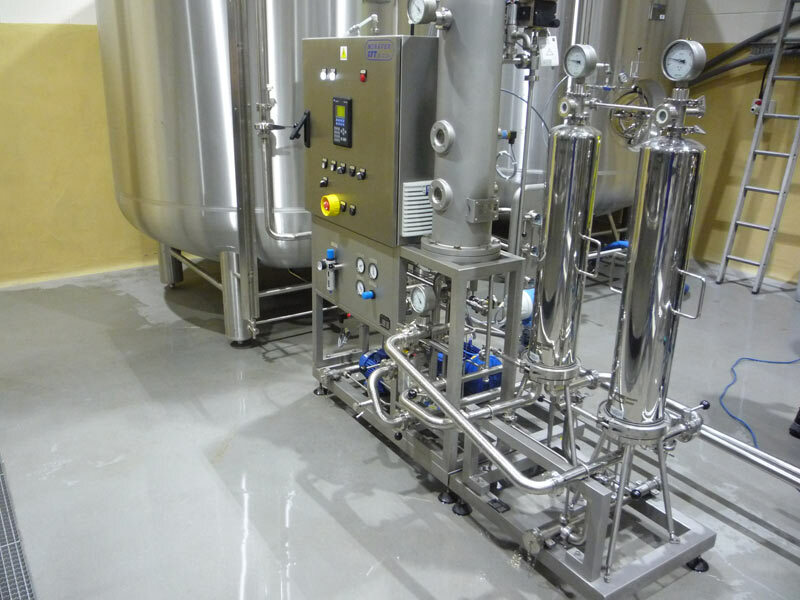 The Moravek carbonator delivers stable efficiently carbonated product to the counter pressure filler resulting in efficient filler performance. The BC beer carbonating unit has a minimum of moving parts and the principle law of physics it uses in carbonation control means the system is inherently simple and reliable requiring minimum servicing. Through a combination proven technology, high quality engineering, integral process control and full pre delivery factory testing the Moravek achieves “off the button” on start up commissioning which continues into reliable day to day production performance. BBT tank specification and costs – needs only 0.5 bar blanket pressure in BBT prior to the BC inline carbonator and filling. 3 bar pressure tank rating not required as is the case for in tank carbonation. CO2 consumption – gas atomise carbonation is 85% efficient compared to in tank carbonation is 65% efficient. Also no need to purge large volumes of CO2 into the BBT’s which is required with in tank carbonation. The BC unit can take CIP solutions from the breweries central CIP system or Moravek can provide a dedicated CIP set for packaging. 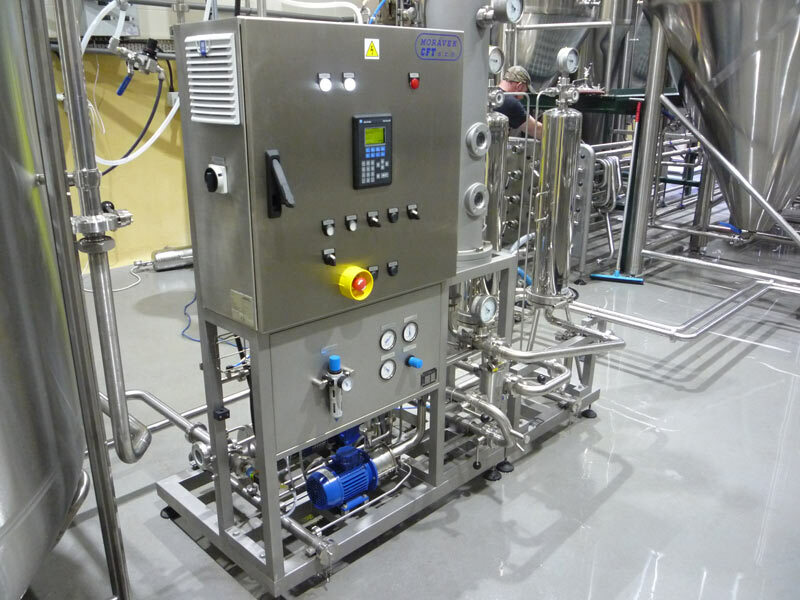 On the BC control panel you can select a number of CIP programmes which will then automatically control and monitor the cleaning process of the complete carbonating, (filtration) and filler to achieve repeatable sanitisation of the system, time after time. An important feature when handling beer. 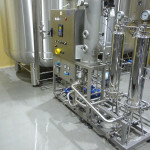 Sterile filtration located right at the point of filling which is technically the ideal location.